We help senior housing providers build relationships around the table to attract residents, retain staff, and maximize positive results. 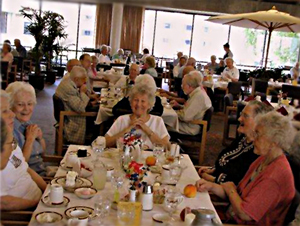 When residents enjoy mealtimes together, their satisfaction and sense of belonging increases. They are more likely to stay longer, be in good health, and recommend your community to their friends. Increase dignity and respect for our parents, grandparents and all those who live and work with them. Transform staff into loyal employees who value their role in improving quality of life, care, and service for residents. Help senior living communities meet or exceed resident expectations, regulatory benchmarks, and their own financial goals. Research shows senior residents who are highly satisfied with meals, food, and the dining experience are healthier and more satisfied in their living environments. Residents’ satisfaction with the dining experience pleases family members, who are then more likely to recommend a community to their friends. Such recommendations are keys to success for providers in the senior care marketplace. Make a significant difference in the lives of your residents, and in your bottom line. Hospitality is a learned skill. Higher Standards is teaching that skill to senior care communities at all levels of care coast to coast. For more information, call Cindy Heilman, MS, DTR at 503-913-1978. To read more testimonials go to testimonials page under Kind Dining® Training tab.